* Engage in mild activity or exercise. Go to a movie, a ballgame, or another event or activity that you once enjoyed. Participate in religious, social or other activities. * Break up large tasks into small ones, set some priorities and do what you can as you can. * Try to spend time with other people and confide in a trusted friend or relative. Try not to isolate yourself, and let others help you. * Expect your mood to improve gradually, not immediately. Do not expect to suddenly "snap out of" your depression. Often during treatment for depression, sleep and appetite will begin to improve before your depressed mood lifts. * Postpone important decisions, such as getting married or divorced or changing jobs, until you feel better. Discuss decisions with others who know you well and have a more objective view of your situation. * Remember that positive thinking will replace negative thoughts as your depression responds to treatment. Research indicates that depressive illnesses are disorders of the brain. Brain-imaging technologies, such as magnetic resonance imaging (MRI), have shown that the brains of people who have depression look different than those of people without depression. The parts of the brain responsible for regulating mood, thinking, sleep, appetite and behavior appear to function abnormally. In addition, important neurotransmitters-chemicals that brain cells use to communicate-appear to be out of balance. But these images do not reveal why the depression has occurred. Some types of depression tend to run in families, suggesting a genetic link. However, depression can occur in people without family histories of depression as well.9 Genetics research indicates that risk for depression results from the influence of multiple genes acting together with environmental or other factors. Anxiety disorders, such as post-traumatic stress disorder (PTSD), obsessive-compulsive disorder, panic disorder, social phobia and generalized anxiety disorder, often accompany depression.3,4 People experiencing PTSD are especially prone to having co-occurring depression. PTSD is a debilitating condition that can result after a person experiences a terrifying event or ordeal, such as a violent assault, a natural disaster, an accident, terrorism or military combat. People with PTSD often re-live the traumatic event in flashbacks, memories or nightmares. Other symptoms include irritability, anger outbursts, intense guilt, and avoidance of thinking or talking about the traumatic ordeal. In a National Institute of Mental Health (NIMH)-funded study, researchers found that more than 40 percent of people with PTSD also had depression at one-month and four-month intervals after the traumatic event. 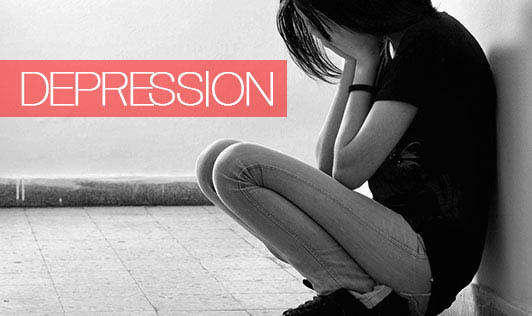 Depression also often co-exists with other serious medical illnesses such as heart disease, stroke, cancer, hiv/aids, diabetes, and Parkinson's disease. Studies have shown that people who have depression in addition to another serious medical illness tend to have more severe symptoms of both depression and the medical illness, more difficulty adapting to their medical condition, and more medical costs than those who do not have co-existing depression.7 Research has yielded increasing evidence that treating the depression can also help improve the outcome of treating the co-occurring illness.